This jam is open to ANYONE in the world! The only Chicago centric part of it is that the cabinet will be housed in Chicago. We'll still pick out games we really like and talk about them on the blog etc. One cool thing about the Indie City Arcade cabinet is that we're going to be housing it in multiple rad locations. In each place we put the cabinet we'll also be looking to run a game jam around the theme of the location. Recently Jake, Phil, and Devon visited Emporium Arcade Bar in Wicker Park. With a little luck and a lot of good looks they managed to snag the permission of owners Doug and Danny to put the cabinet in Emporium starting in January, 2013. So you can probably guess as to what the theme for the jam might be, drinking games! And so the 'Six Pack Jam' was born. 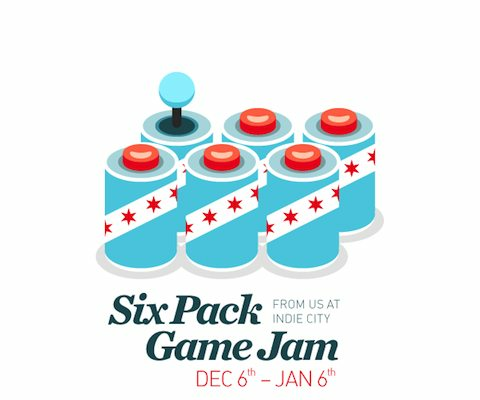 We'll be holding the Indie City Games 'Six Pack Jam' December 6th through January 6th. After this time we'll put all the games created during SPJ into the Indie City Arcade cabinet and then anyone at Emporium will be able to come by and check out the talent! If all goes well we'll continue to do cool stuff like this. Exciting! And how!